It’s late September, mid Spring in Sydney. Blood oranges are still available at the markets but not for much longer. 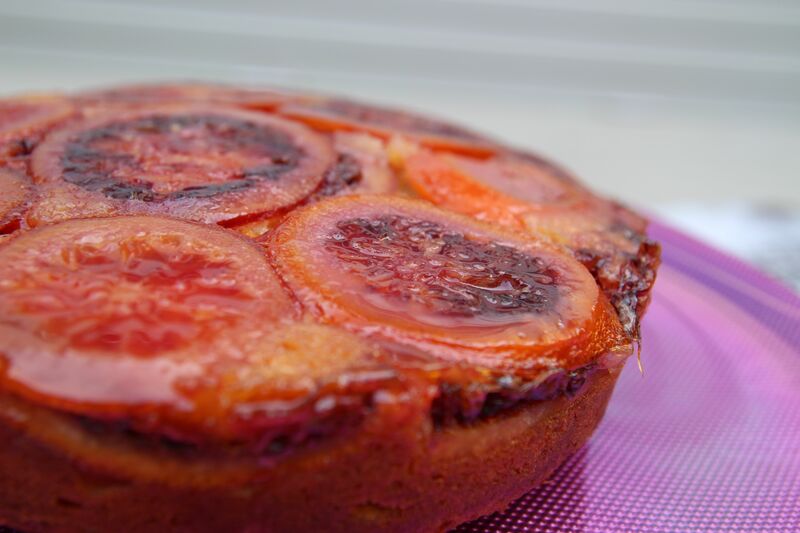 This cake does blood oranges two ways – candied on the top of the cake, (which started off as the bottom) and whole oranges, skin and all, blitzed through the batter. The occasion for cake was as a house warming present for a work colleague who has recently moved house – to my street – in fabulous Rozelle. Finely slice 2 of the oranges, discarding the ends and keeping as many slices intact as you can. Grease a 20cm springform cake tin. Line the base with baking paper, cut slightly larger than the circle base, making sure the paper comes a little way up the sides of the tin. This is as a precaution, in case the syrup leaks out of the tin. Chop 2 of the blood oranges in quarters and remove each end. Blitz in the food processor until reasonably finely chopped – there should still be some small chunks in the mixture. Add the butter and 200g of the sugar and blitz in the food processor. The mixture will look very curdled! Add the eggs and vanilla and blitz again, the mixture will still look very curdled! Gently fold in the flour and baking powder, making sure not to over mix or the cake with toughen. The cake mixture will now look “normal”. 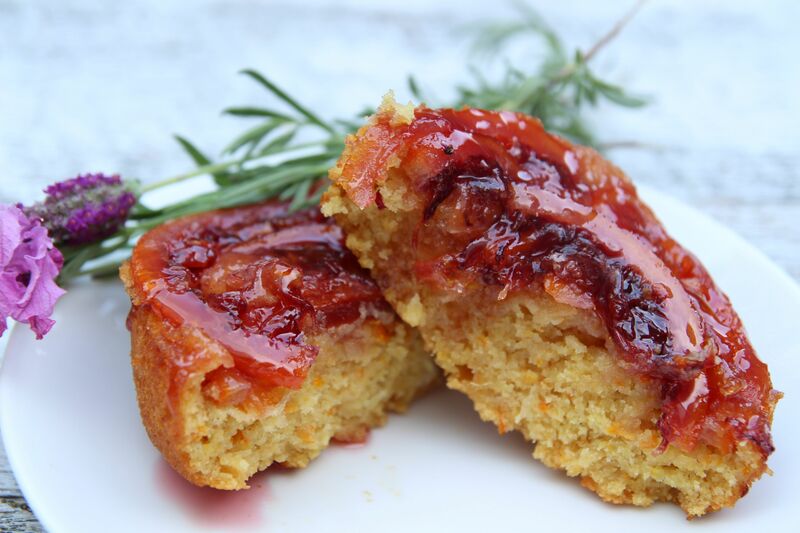 Place the candied orange slices on the paper base in the springform tin, as artistically as possible, remembering, as this is an upside down cake, that the bottom becomes the top. Place the batter over the top of the slices. Gently tap the mixture to even it out. Bake for 30 minutes or until a skewer inserted in the centre comes out clean. Remove from the oven and cool the tin on a wire rack. When the cake is cool (not cold), carefully turn upside down on a serving plate. Release the springform clasp, and carefully remove the ring. Even more carefully, take off the base and peel away the baking paper. You should have a beautiful upside down cake with fruit intact! Brush the cake with the blood orange syrup, or you could serve the syrup on the side as a sauce. Serve with whipped cream or sour cream or creme fraiche. I prefer the latter two as the cake is very sweet and needs to be offset by a little sourness. Posted in Cakes, Sweet Food and tagged afternoon tea, blood oranges, candied orange, dessert, spring, upside down cake. Bookmark the permalink.